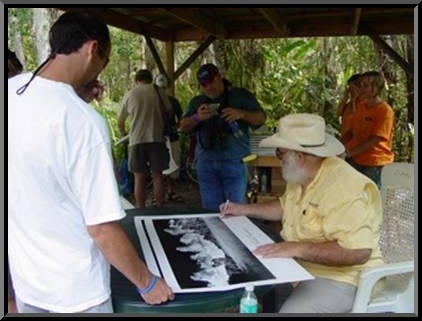 Located in the middle of the Everglades, Clyde Butcher's Big Cypress Photography Gallery displays and wxtensive selection of Clyde's black and white photography, which range in size from a very modest 16x20 inches, to a massive 5x9 feet. Other available nerchandise featuring Clyde's images includes books, note cards, posters, videos and calendars. Leon Whilden was born somewhere around 1914, he graduated high school in 1932 and went on with his education for two years if college at the University of Florida and received a Music Scholarship to Peabody. When the war began, he joined the service and spent most of his time at the African Front, and then in the Pacific. He found beauty in all the horror of war by getting interested in the different kinds of plants, flowers, and orchids at the places he was stationed. 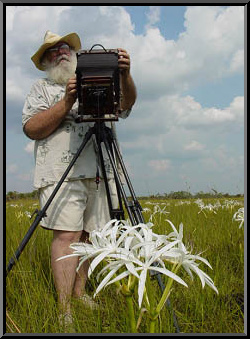 Many of these plants ended up on the property he was to purchase in the Big Cypress Swamp. 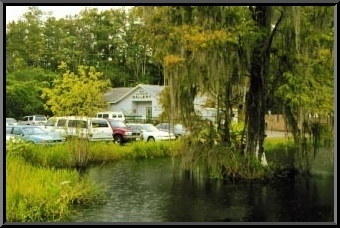 In the 1950s Leon purchased 13 acres of property on the south side of the Tamiami Trail which he called "Orchid Isles" and seven acres across the street on the north side of the Trail. He worked as an engineer for the new Jetport that was being built mid-way between Miami and Naples on the Tamiami Trail, not far from the property he had purchased. It was going to be the largest airport in the world and that was going to change aviation. Purchasing Orchid Isle seemed like a good investment at the time, but conservationists were worried about the impact an airport of that size would have on the environment of the Everglades and the Big Cypress. When the battle was won by the conservationists, the area in which Leon lived became the Big Cypress National Preserve. Leon lost his seven acres on the north side but was able to retain all thirteen acres on the south side of the road. He was lucky, the Park Service said that no one could retain more than three acres of land. Leon went to court and proved that it took all 13 acres to produce his orchids and without it, the Park Service was taking away his livelihood. 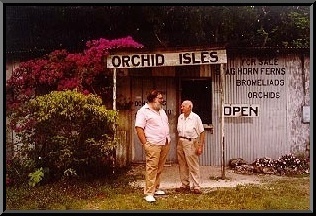 After the Jetport project was shut down, Leon no longer had a job so he decided to sell his orchids to the tourists. 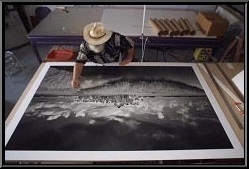 The above photo: Clyde Butcher and Leon... a partership in 1992 where Clyde's Studio had its humble beginnings. December's "Photos to Inspire" features a photograoher whose personel style is reminiscent of a great American photohraphic icon and is yet uniquely his own. He's a captivating personality whose outward appearance is reminiscent of another icon from the holiday season, although he doesn't own a sleigh of reindeer and his home is a Florida Swamp, not the North Pole. He consorts daily with alligators, snakes and mosquitoes while creating beautiful images of an environment that is endangered by human encroachment... an environment he is dedicated to saving. Landscape photographer Clyde Butcher is often compared to Ansel Adams because of his exquisitely crafted black-and-white images of the Florida Everglades, a com-parison Clyde considers a compliment. However, Clyde is quick to point out that his images are about "Spaces," whereas Adams' images are about "Things." "Color is a duplication of nature, black and white is an interpreation." He suggests that most photographers have a preconceived notion of what they are going to photograph instead of letting the world come to them. By letting the world come to you, as a photographer, Clyde suggests that you will find what you are looking for, whatever it may be. The exclusion of people in his images is deliberate. He says by putting a person in an image disengages the viewers from the scene, assigning the viewers' space to that person. Clyde wants viewers to be fully engaged in the image he's created. A personel tragedy changed Clyde's life forever. In 1986, his teenage son Ted, was killed when a drunken driver crashed into the car in which young Butcher was riding. Creating something positive out of something negative was Clyde's way of making something meaningful out of his son's life. By seeking solace in the Everglades, he real-ized that human encroachment could lead to the loss of this natural wonder just as easily. In recent years, Clyde has become a passionate preservationist. 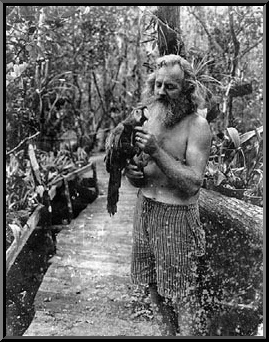 Realizing that human impact in the form of development was behind the loss of more and more of Florida's wetlands, he set a course aimed at making people realize that the loss of this magnificent and fragle environment with its unique natural beauty, would be an enormous loss to future generations. Clyde's website> http://clydebutcher.com/journal.cfm?holdtype=129 offers a wealth of information about the man and his work as well as fascinating information about his 1,600 square foot darkroom. 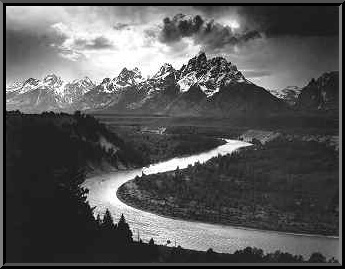 His photographs of wild places are stately and dramatic, and his physical appearance recalls Ansel Adams's iconic mountain-man look. 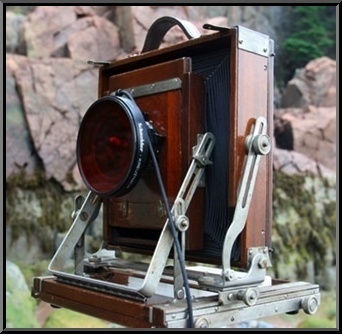 Butcher takes photographs only with view cameras ranging from 4x5" to 12x20". But unlike the maticulous Adams, with his lifelong emphasis on ultra-precise technique and pre-visualization, Clyde Butcher takes a different, more casual approach... ay least in the field. He's more like a man out for a lark who just happens to be toting a really big camera, which he says he often uses almost like a point and shoot. "When I'm in the open sun I don't use a light meter. Why would I? The sun is a constant, about 93 million miles away. So I shoot at f45 and either one half or one second, usually with an orange filter. This way i can concentrate on what I'm seeing... its better than an automatic camera!" (No Batteries Required) he adds. He's interested in breaking down the barriers to do good work. The Venice, Florida-based photographer runs a flourishing Black & White retail business from two Sunshine State Galleries... he sells prints, publishes books, calendars and teaches. Butcher however, has no time for the super serious techno-focused approach to B&W photography. For example: at the mere mention of characteristic curves he says, "The only curve I like is on a woman. I sort of understand curves, but I don't care. If its not a good picture, who cares what the curve is? A good photograph will overcome any curve." (Characteristic curves, the provence of hard-core Zone System devotees, are S-curve graphs representing the negative density resulting from each exposure level.) He uses only (his own) standard film development times, eschewing contrast-altering plus and minus development times. "Simplify Everything" he emphasizes. 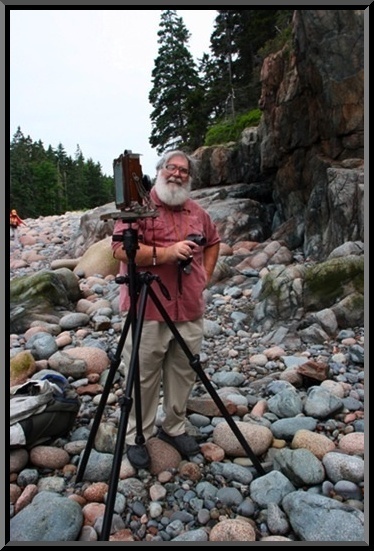 His approach in the field is more like a time-pressed commercial photographer than that of Adams or Edward Weston he says. The last pre-visualized photo he made was in 1983. He planned the image (sea oats, sand, ocean and sun) and spent a week looking for the location and another week waiting for the image and light to be just right. All that time paid off. He claims he's built at least one house with the profits from that shot, but wonders how many more great shots might have resulted if he'd just let two weeks of images just come to him. Butcher believes photography should be fun, and really big camera in hand, he sets out to have fun. He figures any angst can come in post production. Butcher mostly prints in the darkroom. However, he is adept with Adobe Photoshop, as students at his Photoshop workshop at Cone Editions Press in Vermont... home of Piezography Inkjet B&W Printing, learned in June 2007. His Photoshop approach is, not surprisingly, all about keeping things as simple as possible. Adams and Weston only had #2 and #3 paper, so they had to make their negatives fit that range... hence the Zone System. Butcher explains: "With variable contrast paper and, of course Photoshop, the game has changed. I say, let's be hacks in the field," he chuckles, "and have fun... just look for the good light and fake it in the darkroom. Light is always interesting, just follow the light." "Visions of the Next Millennium"
to include other areas of the United States. "I want to show people that there is a unity between all undisturbed natural places. My hope is to educate and inspire... to let people know our land is a special place and the way to take care of it determines the future quality of life in our society." 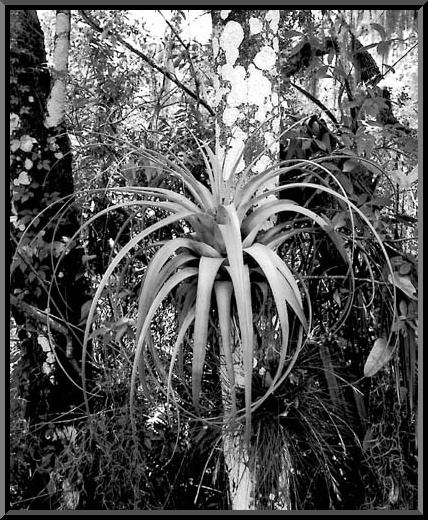 These words are a prelude for the thirity-seven remarkable images of natures splendors that Clyde has so eloquently captured on black and white film using his 8"x10" view camera. 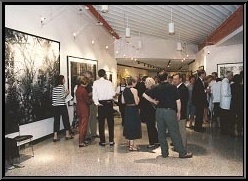 The images range in size from 60"x105" down to 40"x60" and are printed on fiber based paper. Because of the large size of the photographs, the viewer's eye cannot take in the entire image in a single glance. That's Clyde's aim. He want's the viewer to take time to experience the moment. As Clyde is fond of saying, "Most people are into the destination of the journey." Thankfully, his journey has given us rare and rewarding views of what once was, and in many cases still exists, but only if we are concerned enough to preserve it for future generations. Several years ago, Clyde had a dream of creating an exhibit containing very large photographic images taken from all over the United States. His hope is that it would "Show people that there is a unity between all natural places, and the way we take care of it determines the future quality of life for our society." "Every century and every millennium is born into a new agenda. Earlier periods of human history has been characterized by basic elements of prosperity; Bronze; Gold and Steel. In more recent times, we rapidly pushed back frontiers of thought in spurts of human enterprise that define centuries as distinct eras." We often hear people describe the coming new age as an Infornation Age, but without content or connection, information has no use. I believe the coming age has more substance to it than "Information." I believe it is the way we choose to use the information that will change our lives and that choice will determine the future of our world. If we are to survive as a healthy species, we are obliged to go forward into this new age with the preservation and restoration of the environment in the forefront of our thoughts. We must establish an ethic toward the Earth that will penetrate the very soul of our existence. Unless we perceive our connection to nature in a deep and personal way, we will face a future of decline instead of prosperity. I believe the coming century will be one of the most active ecological centuries human history has ever seen and that the Ecological Age, will begin the momentum that will carry on into the millennium to create a healthy future for all mankind. To bring a land ethic into reality, people with vision from all fields need to come together in a holistic manner to produce a creative momentum which will inspire society to "Walk a Higher Path" and in doing so, establish a foundation on which future generations can stand. I believe that artists are vessels of inspiration that can convey this message. As an artist... I reach deep within myself in order to express an image which will touch another. Art is an intimate experience. It is with that intimate experience that I believe the artist has the power to transform and bring a new insight into life. Through their creations, artists have inspired society since the beginning of time. Two of the best known inspirations of our country are Thomas Moran and Ansel Adams. Thomas Moran painted Yellowstone, and it was his artistic vision that enabled Ferdinand Hayden to convince our government to save the Yellowstone as our first National Park. 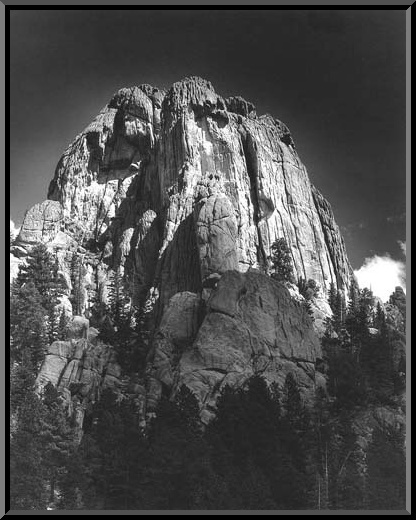 Annsel Adams used the power of his vision to bring Yosemite and its beauty into the public eye, strengthing The Sierra Club and the activity of environmentalists to save the beauty of our land. It is because of the power of the artist to touch the emotions of another, that I have encouraged all of my artist friends to become involved in transforming our society to view the Earth as a spiritual place for which we all are responsible. For my part, I am reaching out with my exhibit, Visions for the Next Millennium to begin a new era based on an understanding of humanity's profound connection with nature. My images will be presented to the viewers with the goal of helping them see the beauty and sublime order of the natural world, both in great places like the Everglades and the Redwood Forests, as well as in lesser known urban parks and wild places. I want to show people that there is a unity berween all undisturbed natural places, whether the peak of a renowned mountain range, or a stream-bed in an urban watershed. My hope is to educate and inspire... to let people know our land is a special place and, the way we take care of it determines the future quality of life for our society.